Sold in January 2015, the 39.4 metre motor yacht Serenity J is back on the market, renamed Lady Azul and listed for sale by Jan Jaap Minnema at Fraser in Monaco. Lady Azul was built in steel and aluminium by Dutch yard Heesen to a design by Omega Architects and, ABS classed, was delivered in 2001 with a full refit in 2015. This full-displacement yacht has accommodation for 10 guests in five cabins, including a full-beam owners’ suite on the main deck. Below deck there is a VIP suite, a double and two twins, all with entertainment centres and en-suite bathrooms. 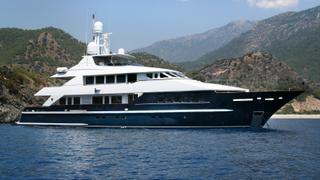 A further four cabins can sleep up to eight crewmembers aboard this yacht for sale. Her interior, by Paola D. Smith, is bright and luxurious with a timeless appeal, offering a large skylounge with comfortable seating, a bar and an entertainment centre including a Samsung 80-inch television screen and a Kaleidescape on-demand audio and video server. The upper aft deck has all the amenities needed for al fresco entertaining while up on the sun deck is another seating area, dining table, sun loungers and a gas barbecue grill. She also offers a good-size tender garage and has been maintained to a very high standard. Fitted with twin Caterpillar 3412C-DITA 825hp engines, both economical to run and very quiet while under way, Lady Azul is capable of a cruising speed of 12 knots. With a 46,500 litre fuel capacity, she has a range of 3,500 nautical miles at 12 knots and is fitted with Trac zero speed stabilisers. Lying in Malaysia, Lady Azul is asking €6,750,000.